John Bach is Enemy #1 in the eyes of many officials in the City of Northport. His emails, which have been sent to a wide array of people in West Alabama, have been critical of the way things have been run in Northport, Alabama. Some have concerned the improper use of vehicles owned by the City of Northport by its employees. There have been questions about the inappropriate use of taxpayer funds when outside firms have been hired to do jobs that might well have been done by city employees. John Bach’s first emails actually were centered on why sidewalks weren’t included in plans for a road widening project. But his concerns have multiplied since then. The questions that have centered on the activities of Community Relations Coordinator Julie Ramm seemed to have roused the ire of City Administrator Scott Collins the most. Bach said that she’d modeled the new ensemble at City Hall that she was planning to wear during a West Alabama Chamber of Commerce Fly-in to Washington, DC. Then she’d used a sporty city car to go to the airport. One of Bach’s emails included an image of a fake television show promo, which he said had been sent to him in one of the many emails that are sent to him by employees and others who provide him with information. Bach has intimated that Julie Ramm oversees the activities of Northport’s Police Department. “As many of your employees have noticed Ms. Ramm’s personal taxfunded sportscar hasn’t been parked at city Hall this week because no one else gets to drive it but her. How much is she costing taxpayers to leave it parked at the airport? “I am told that Ms. Ramm spent time at city Hall showing off clothes she bought for her tax-funded trip to Washington, D.C. Why does a Community relations Coordinator need new dresses for a work trip? Is there a Mr. Ramm? Of course there are far more substantial matters than what car Julie Ramm drives or what she wore on a trip that Bach discusses in his emails. 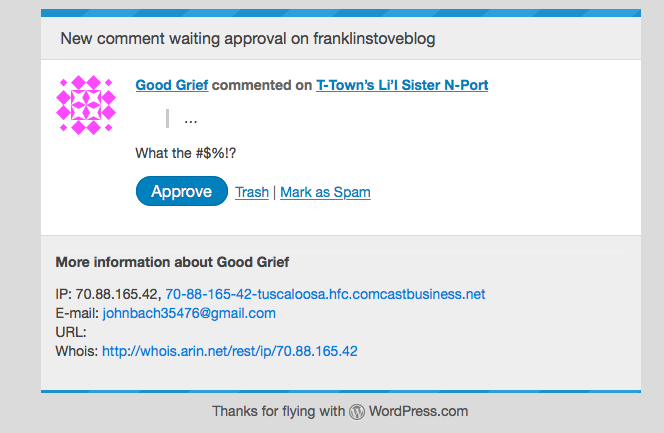 But, as a result of an obsession with Bach, it is highly likely that employees of the City of Northport have created fake John Bach email addresses to create fake Facebook pages purporting to belong to John Bach, have sent a purient email with his address altered by one number, and have even tried to comment on a post on the Franklin Stove Blog. The comment was linked to the city’s Comcast account. 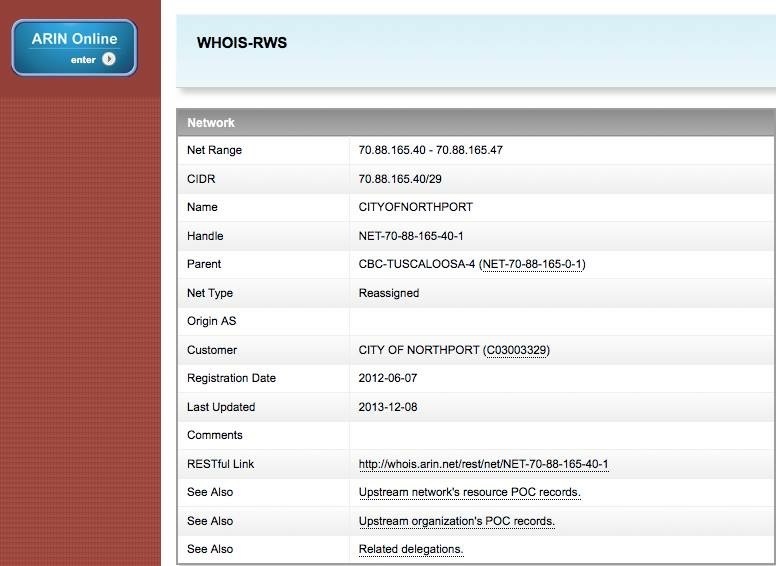 It used a fake John Bach email address and the identity “Good Grief” with the message “What the ….” ARIN Online identified it as coming from an IP associated with the City of Northport’s commercial Comcast account. delusional mental state and psychotic behavior that my vision stays blurry and everything around me smells like urine. I even drink my own urine sometimes to compare it to what I smell. Doubtlessly none of the usual recipients to which Bach has sent emails thought that the email about drinking urine originated with him. 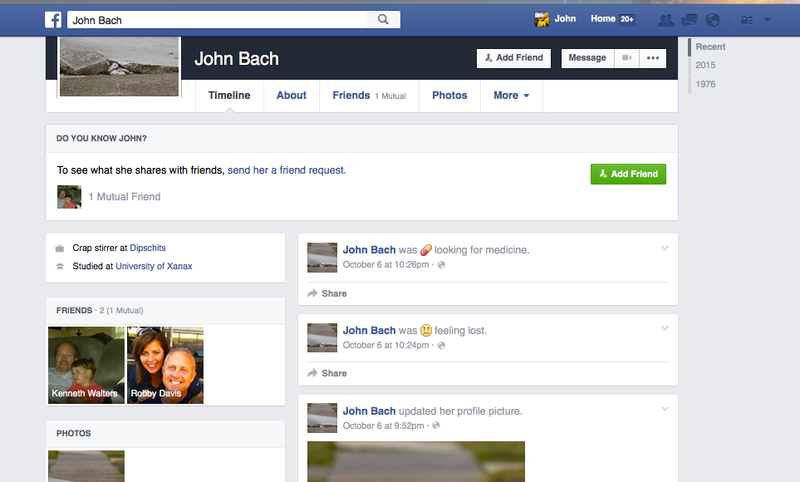 In all likelihood the true identity of John Bach, emailer extraordinaire, will never be known. The fact that some in the city government of Northport are obsessed with just who John Bach is must mean that the answers to some of the endless questions that he asks in his emails might be very revealing. ← No Longer A Cog In The Machine? In John Bach’s latest email: “The Northport Police Department is tired of having to go to a new firing range every few months. 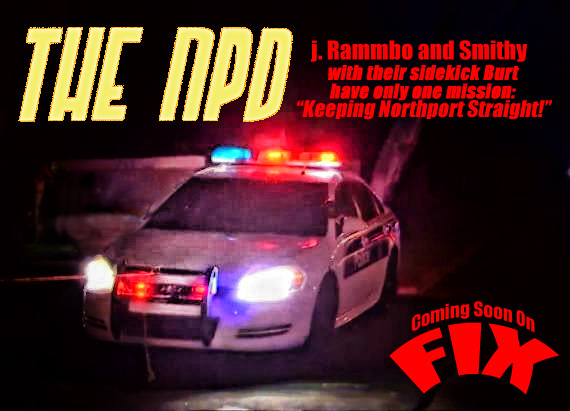 Northport used to share the Sheriff Department’s firing range, but apparently a certain lieutenant was handing the keys out like sticks of gum. The Sheriff got mad that his firing range was being used like a personal playground and Scott Collins said he’ll do whatever he wants and took his toys and left. That’s why Scott is wanting to spend who knows how much in taxdollars to build another firing range in Tuscaloosa County. How many are needed? Does every agency really need their own? What a waste. Also people got mad about non-police such as the community relations coordinator going to the firing range.